And on the topic of Justin's mom, I got this recipe from her. She usually makes it with sugar-free gelatin and sugar-free juice. I happen to get horrible headaches from too much artificial sweetener, so I went for the regular, full-sugar versions. But if you are trying to shave a few calories, go for the sugar-free stuff. It's tasty either way. 1. 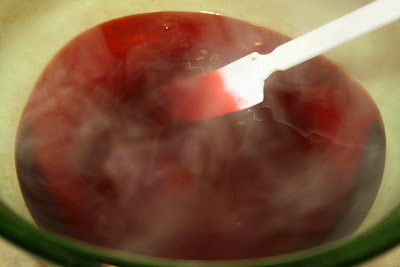 Bring the cran-raz juice to a boil. 2. 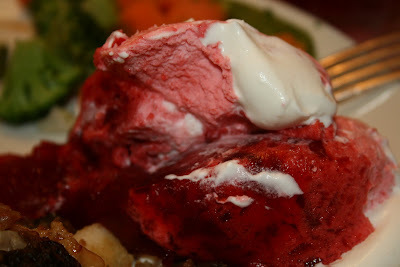 Dissovle the raspberry gelatin in the hot cran-raz juice. 3. 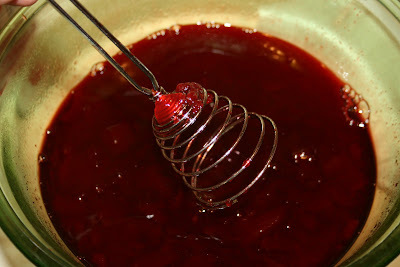 Add the cranberry jelly and mash and mix it in. It doesn't have to be smooth. Small jelly chunks are yummy. 4. 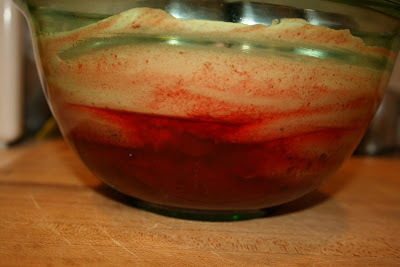 Pour into a large serving bowl and refrigerate until it starts to gel, about 2 hours. 5. 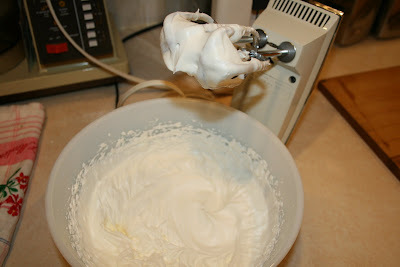 When the gelatin is thickened, but not set, beat the whipping cream until peaks hold. 6. 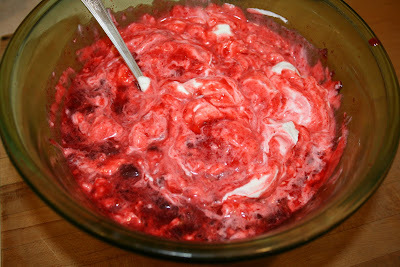 Mix about half of the whipped cream into the thickened cranberry mixture. 7. 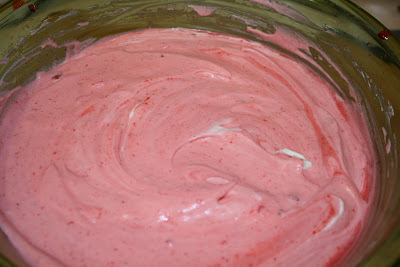 Smooth out the mixture. 8. Spread the remaining whipped cream on top. You should be able to see the layers. 9. Let chill until set. 10. Serve with your holiday Turkey.